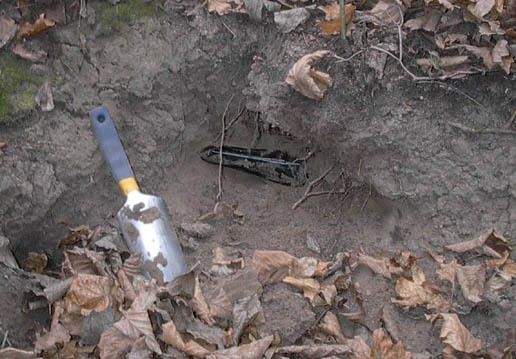 After things in Bukrin went in nowhere, the SS division "Viking" re-deployed some 70 kms on south and took part in the battle called Korsun, which became known as "little Stalingrad on the Dnepr river"
The name, because a strategic importance and situation itself reminded a situation with 6th Army, which was surrounded and destroyed at Stalingrad. At this point German army has been forced off from Dnepr river everywhere, except for a Korsun region and it formed some sort of a bulge in the German line. Soviets launched attacks and closed a ring around two German army corps. This battle was a complete disaster for a Germans resulting in their surrender. 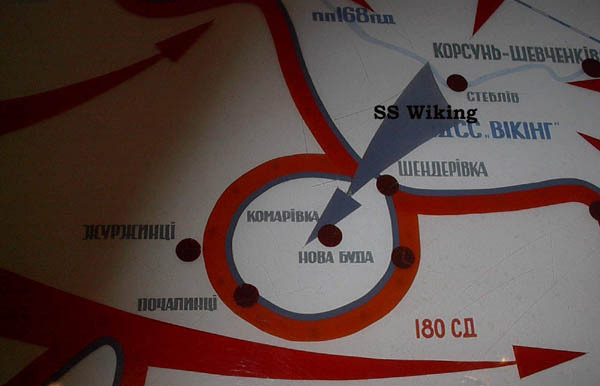 The map shows the last maneuver of SS "Viking". This division died in Korsun. I believe, three dozen of Vikingers got out of encirclement. They returned to Berlin, kept spirit of fighters and Hitler awarded them. Speaking of SS awards. I don't know, which one was the highest award, but I know which is the most valuable on a black market this days. It is “Death’s Head” silver SS ring, we call them a dead head rings. Chances to find “Death’s Head” not big. Himmler himself awarded SS soldiers with them and each ring was engraved on the inside of the band with Himmlers signature and after one died the search group have been deployed to find the soldier with rings, all death's heads should be returned to Himmler. He eventually got back only 70% of rings that were given, the rest 30% lost, many in WW2 trenches. Himmler kept SS rings in a Wewelsburg castle which was the temple of SS order. He kept them in a special urn that symbolized connection between alive and dead. I also, read somewhere that Himmler was doing some other mystical manipulations with those rings, but I don't know what exactly and I doubt Himmler himself knew what he was doing. The ring on photo is not real, it just a copy. 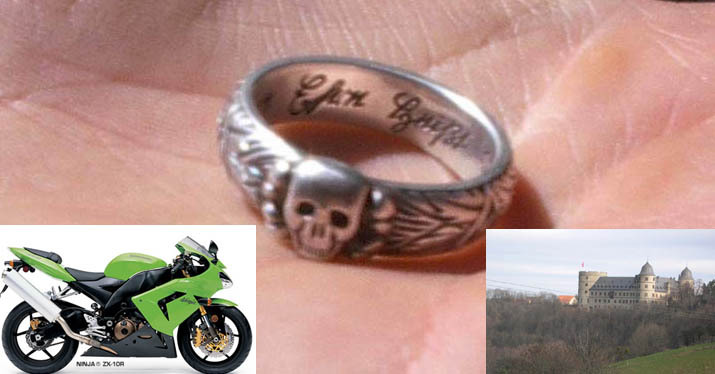 If I was lucky with finding a real SS “Death’s Head” ring, then you wouldn't see me riding scooturo on the trenches, I'd already ride a new ninja bike on highway. Collectors pay a big bucks for original rings I have got a copy, because I don't want to miss a real ring when I find it. Also, I spared a bottle of wine to celebrate it.